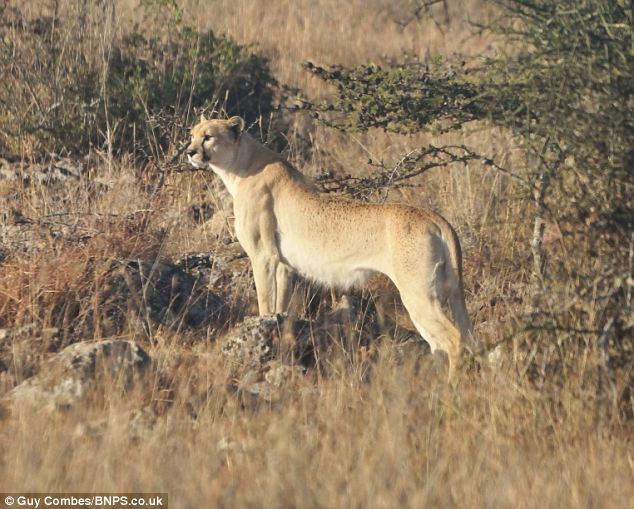 A rare big cat was sighted by Guy Combes, a British Wildlife photographer after he had heard about several reported sightings of a lesser-spotted cheetah in the Kenyan plains. After looking high from an airplane and low from a Land Rover, Combes gave up trying and went back to Nairobi. After receiving a call that the unique cheetah had been seen, he decided to try again. This time Combes came within fifty yards of the incredibly rare spotless adult cheetah with its spotted mother. Experts say the last recorded sighting of a cheetah with a plain tawny coat with freckles but no spots was in 1921, nearly one hundred years ago. After searching over 100,000 acres without borders, Combes feared he would not be able to find the magnificent cat that only a hand full of people will ever have the honor of seeing. 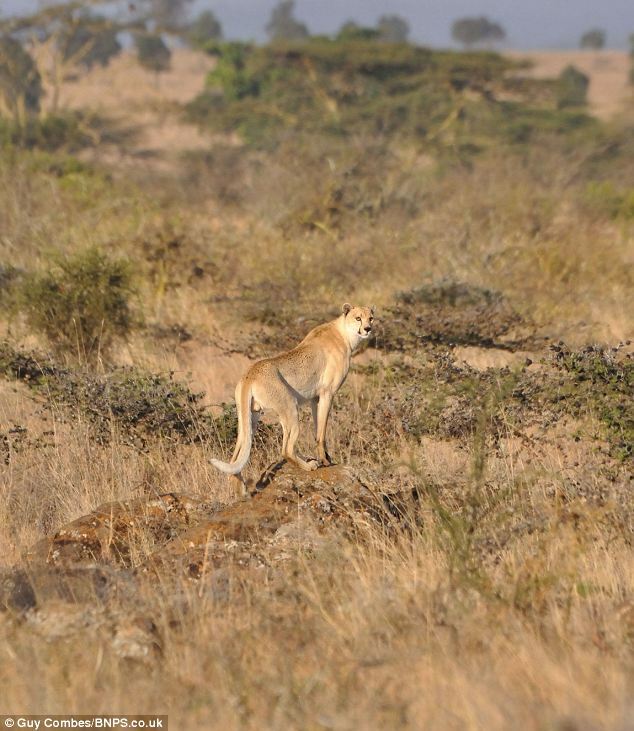 Combes discovered the spotless cheetah at the Athi Kapiti Conservancy in Kenya. The genetic mutation is thought to actually give this cheetah an advantage in the wild as this cat could easily be mistaken for a lion. As you can see in the photo above, at first glance you might assume you were looking at a young lion. A King Cheetah has a rare fur pattern mutation. A recessive gene must be inherited from both parents in order for this dappled pattern to appear. Scientists theorize that the recessive gene that caused the lack of spots on this cheetah is similar to the phenomenon that causes the dappled markings of the“King” cheetah of South Africa and Zimbabwe. Unusual coat patterns such as this are natural variations that occur due to spontaneous genetic changes in genes. The conservation status of the cheetah is officially classiged as vulnerable with an estimated 12,400 remaining in the wild in twenty five African countries. 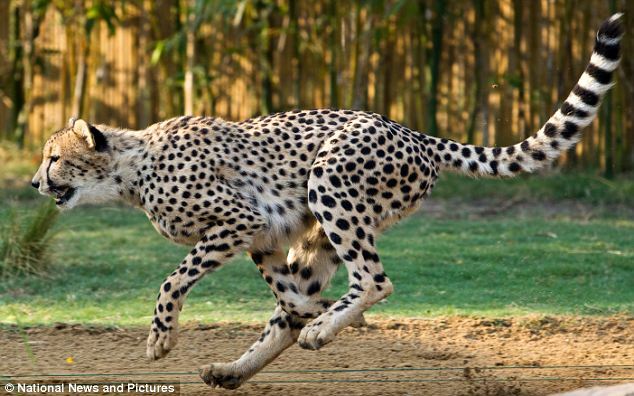 Namibia has the largest population of cheetahs with approximately 2,500 in the wild and wildlife officials believe there are only 50 of the Asiatic cheetahs remaining in Iran. The wonderful photographs taken by Guy Combes give us the chance to see this incredibly rare amazing cat and it is quite thrilling even if in the form of a photograph. Of course, I never get tired of looking at any cat big or small. 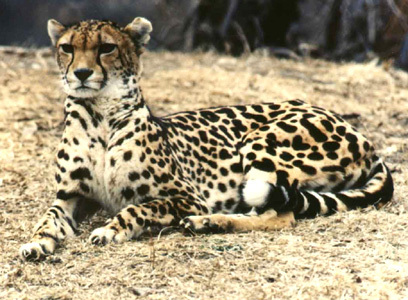 The familiar pattern of the cheetah. When I look at the top photo it reminds me of America’s cougars. But, the photo from behind does not. Amazingly beautiful! Such a beautiful cat!!! Freckled cheetah — what a wonderful find!!! They are all beautiful. Spots, dappled spots or just freckles. I would love to see any of them in the wild. Great article and pictures, Gracey. Thanks for sharing it with us. I think all cats are beautiful too. I am going to look at the “Strawberry” leopard now. He is quite handsome even without his spots, isn’t he? Thank you for stopping by to read about these beautiful cheetahs. Thank you Sue for stopping by to visit and look at our big cat cousin’s photos. Awesome! Thanks for sharing, Gracey! Did you read about the “strawberry” leopard that was also recently spotted? BIG CATS RULE! I did see the information about the “Strawberry” leopard. Isn’t that also interesting? That is way cool that he saw it and got pics! It is amazing isn’t it Rumpy? And we are super lucky to be able to see the photographs.